There are only a few things that come across my mind while I’m sitting in front of my computer. Many of them involve my plot to take over the world through literature. Another involves me owning an empire of five different restaurants, and the last is just getting my latest novel represented. All of these things are grandiose things that take time and serious effort along with a strong willed back bone, yet discouragement shows up yet again. The past year of my life has been guarded by work, and more work. I’ve blogged about this before. Then I ask myself, “why, a whole year later, am I still making no sales and in no better situation than I was then?” BOOM Discouraged! I sit at this damn computer and research all day long. I read other’s blogs, information about marketing, get caught up in crappy sites that try downloading viruses, and by the end of the day there’s little to show for the hours I “wasted” away. I sit back in what some may call a wake of disappointment, or a self depreciating stare, or maybe even a slight trickling into the bottomless depths of depression. I couldn’t stand it anymore. I had to get out and do something. I had to go and see friends, listen to music, smell the fresh air, be surrounded by family, drink a glass of wine with my brother, drink another with my sister-in-law, then a third by myself. I kicked off my socks, rank with the smell of the gym from earlier in the day, and dawned a fresh pair before I made way to my car. I drove, in rush hour traffic, along 22, nearly falling asleep before the split decisions that I used to love came into play. I diverged from the highway and sped along little side roads. Every curve yielding a surprise I hoped wouldn’t be fatal. My windows were down and the sun was nearly gone by the time I had found Nazareth. Here I slowly careened past moms house to see no one was home. I then breezed past my brother’s house to see that there wasn’t a single light on. 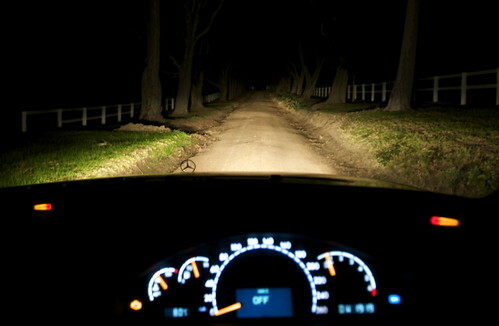 Then without skipping a beat I drove through the old roads that I used to triumph over. Roads where memories were made of my friends and I driving in my old pontiac without a care in the world. The breezed pattered past my ears while I inhaled the cigarette that had a refreshed taste to it out here in the sticks. I thought about stopping at some of my old stops, but continued to drive past them. In my driving I had found what I thought had been lost. I once drove to clear my mind, but with the rising gas prices back in ’08 I had to stop. Now today I drove and felt good about everything around me. I watched stars pass my window and the mysterious moving light, which in years before I would have thought to be a UFO. I came home as somebody I thought I had lost only a few hours prior. So, thank you, car ride. You helped me overcome my worst adversary, discouragement.